Over the last few days, the Bangalore edition of The Hindu newspaper has carried two articles on lakes, both involving our Puttenahalli Lake. 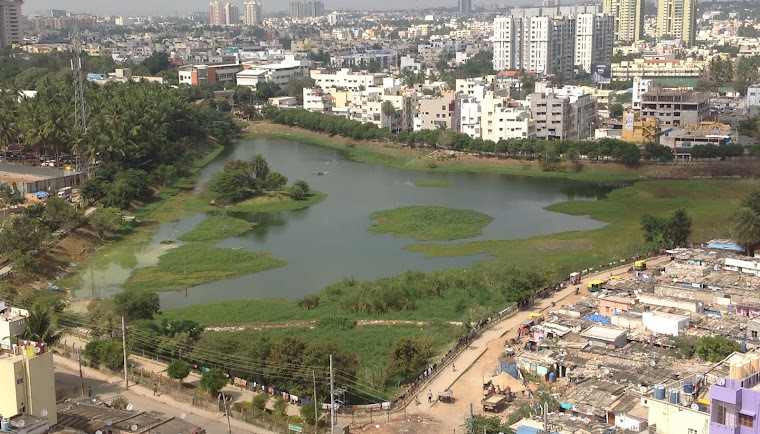 Given that the title of the article was incorrectly connected with Puttenahalli Lake, PNLIT trustees wrote to The Hindu informing it that the picture was misleading; that PNLIT is continuously monitoring the inflows and is prompt to take action to ensure that sewage does not enter the lake. 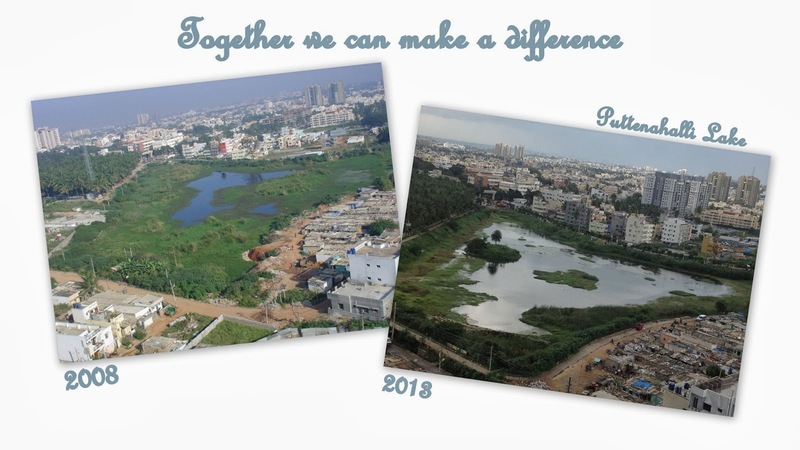 - life cycles of rain-fed lakes (most of Bangalore's lakes are rain-fed complex ecosystems). During a good monsoon, if the water from the surrounding areas is diverted to the lake, the level of water in the lake rises (June - December), as we have seen at Puttenahalli Lake this past year. With the retreat of the monsoon and the onset of summer, the water level starts dropping. In small lakes and ponds, while the deeper parts hold out, large portions dry out completely. The very fact that the water is still holding out at your lake is an indication that the ground water too is holding out. Let the water level hold on its own and let us allow the natural process to go on as it used to. Summer drying will breath a fresh life into the lake, once the pre-monsoon inflow starts. This is necessary to kill-off all the invasive plant species before the next monsoon arrives. This also gives us a chance to do the necessary repair-works in the lake-bed: get to work with spades to scrap-off those unwanted weeds, cleaning-up channels, drain pipes, etc. PNLIT is working to strike a balance. We hope that this information we have shared gives you a better perspective of lakes and gives you answers to the questions skeptics may pose when you talk of the "success" at Puttenahalli Lake. Dry lakes in summer should not be equated to "money down the drain". There's no need for you to suffer from retirement blues, an empty nest syndrome or wallow in a "nothing to do" void. If you believe in action over words (and emails), use this as an opportunity to reinvent yourself. Discover what you can do by actually doing it. 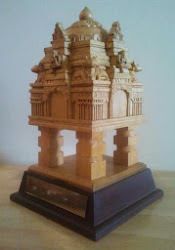 Maintaining Puttenahalli Lake offers many and varied opportunities to do just that. 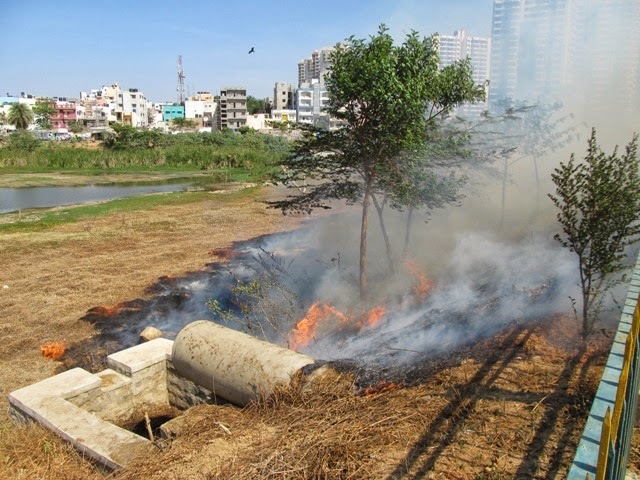 As recently as 2009, Puttenahalli Lake was a picture of neglect and gross misuse but with some of us taking on the challenge of restoring it, the lake is getting a new lease of life. The journey has been exciting and challenging but it is far from over, neither for the lake nor for us. It is time to assess how far we've come and what more needs to be done to complete the transformation of the lake. 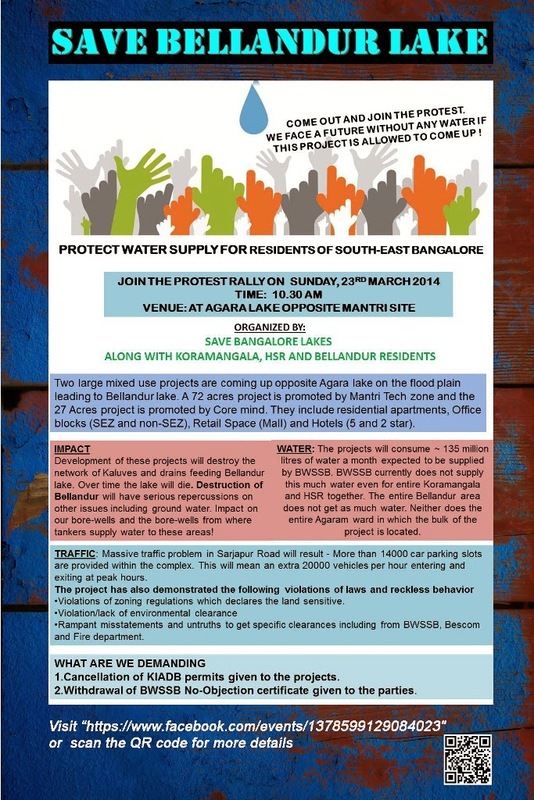 To discuss these, we're meeting at 5 p.m. on Sunday 23rd March at the Puttenahalli Lake Gazebo. Get to know what we've done and why. See how you can pitch in, alone or together with your family and friends. Help yourself by helping nature. Please drop a line to Usha <puttenahalli.lake@gmail.com> to confirm your participation. My friends and I would spend time counting the males and females, that are easily distinguishable. One of our story books had a tale about why the male has black marks on its neck while the female does not. I couldn't remember the story, but after searching the internet, found a blog post on this that can be read here. It was not uncommon to see sparrow nests between the inner and outer layers of our house's tiled roof. After the babies were out, and the nest abandoned, we'd be fascinated by the intricate construction and warmth that enabled the propagation of the species. Slowly, and rather surreptitiously, the sparrows vanished from Bangalore. Common people who may have hardly noticed their disappearance, would be reminded of them years later, only when they found the birds jump onto their tables at Bangalore's Devanahalli airport. There are many theories about why the sparrows may have left Bangalore. Over the last few years, several efforts have been made to bring them back. Last year, Gubbi Labs complied a small book "Of House Sparrows and Human Settlements", that gives the distribution of House Sparrows in Bangalore. The book can be read/ downloaded here. In Mumbai north suburbs, where I currently live, sparrows are abundantly found, and I'm happy that the children around here share some of my childhood sparrow joys. Wish the same for Bangalore too. Couldn't resist the morbid pun in the subject line. :-) On a more serious note - several of you have expressed concern about the birds affected by y/day's fire. Well, we didn't have the heart to inspect the burnt areas in the lake bed today more so because the adult birds would have fled leaving behind the chicks and eggs. We have to let nature take its course and do the repair work. A few showers will help. We got the gardeners to mend the fence, water the burned down trees and shrubs in the hope that the roots would be revived and perhaps new leaves would sprout. To prevent a repeat incident, the gardeners have begun controlled burning as advised by the fire men. They are collecting the dry weeds away from the trees and burning them in small piles. Till we raise money for a composting unit, we'll unfortunately have to follow this practice to prevent arson. 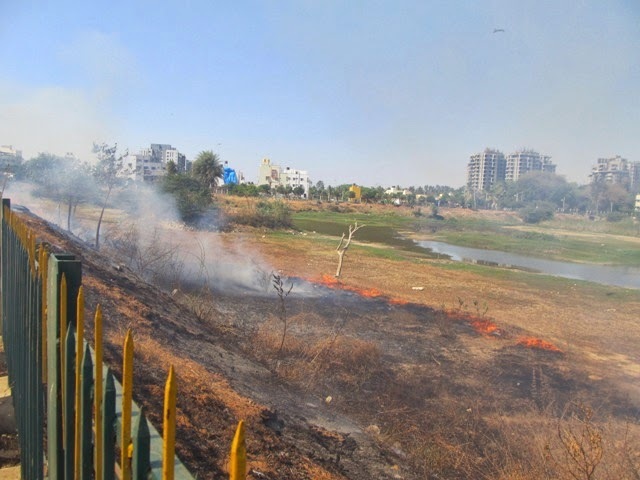 Prime Jyothi from Brigade Gardenia, an avid butterfly enthusiast and photographer had come to the lake today morning to see the damage caused by the fire. 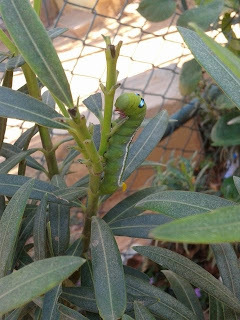 He came again in the evening and spotted some Oleander Hawk Moth caterpillars. 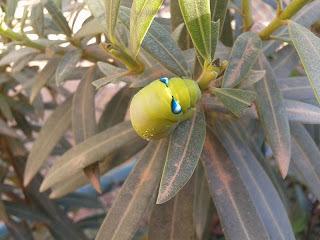 Not surprisingly, they were found on the Nerium Oleander in the garden near the Gazebo. We had planted the Oleander and the other plants there specifically to attract butterflies and moths. The Oleander Hawk Moth is apparently a large sized moth found in Africa and Asia and is said to be a migratory species. For more info see here. While residents were celebrating Holi, we were battling a fire at the lake. Today at about 2.30 p.m., we spotted smoke and rushed to the lake. Some miscreant, we think, must have flung a lighted cigarette or beedi on the dry grass on the revetment. It took just that simple action to set off a conflagration which spread not just on the slope but also along the dry areas of the lake bed. Today being Sunday, our gardeners were off duty and the home guard it seemed had decided to take a holiday. 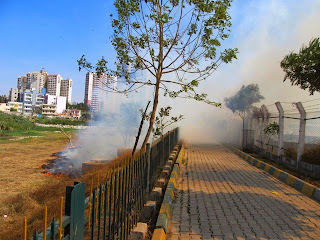 We called the fire brigade and got the flame doused but by then quite a number of our trees and shrubs had suffered. Our gardeners have been clearing the slope but not the lake bed because here's where birds like Ashy Prinia and Bulbul frequent. This was also the place we'd spotted the Bay backed Shrike a few months ago, rare for an urban setting, as mentioned in our post here. Even as the fire raged and smoke billowed, a flock of kites hovered around. We do not know how many of the Prinias and Bulbuls and other small birds perished in the fire. All the water birds had moved to the far end, away from danger so they are safe. A request to each one of you who uses the lake even as a short cut - if you see anyone smoking a cigarette or beedi, ask them to put it out at once. 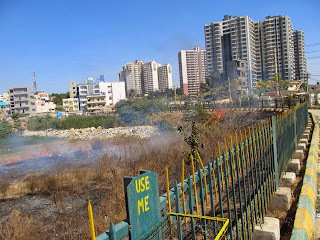 Show them the burnt grass. Please wait to see that they indeed put out their cigarette or beedi. Thank them for saving the birds from another fire. The lake belongs to all of us. Help us take care of it. In 2010 when we wanted to reinforce the chain link fencing around the lake, the choice of the plant was unanimous. 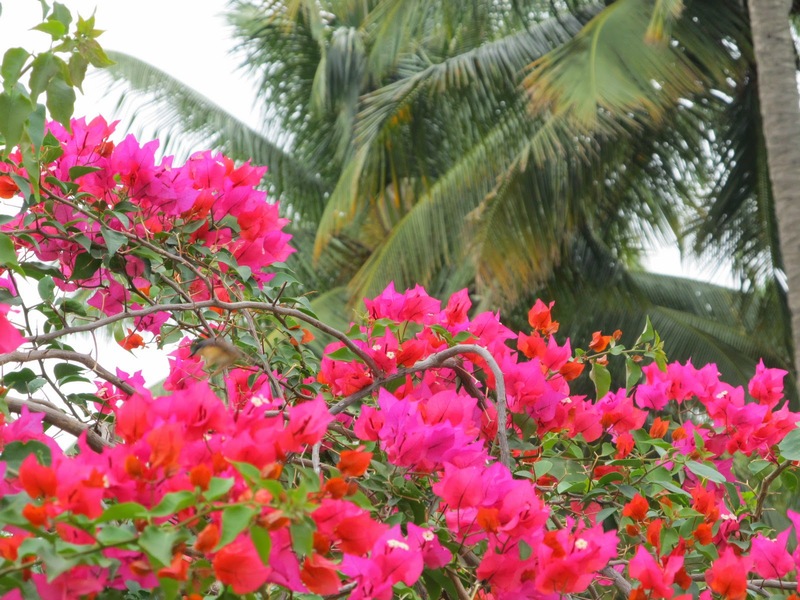 The Bougainvillea. It is thorny, hardy with attractive paper thin flowers and, best of all, low maintenance. Along the fence we planted cuttings sourced from pruned waste from Brigade Millennium. Some of them grew, many did not. The next year we planted some more with the same result. Those that did survive began to grow lush and enlivened the lake with their vibrant colours. We took great delight in the grand spectacle. Recently, however, we noticed that the flowering was even more riotous OUTSIDE the fence! Huh? We do all the work and it flowers outside? 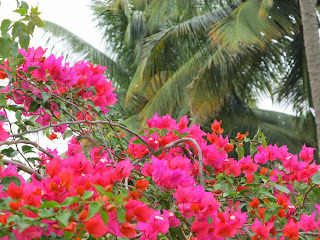 Well, it is too late to train the bougainvillea which is merrily covering large sections of the fence and providing a gorgeous sight to passers-by. 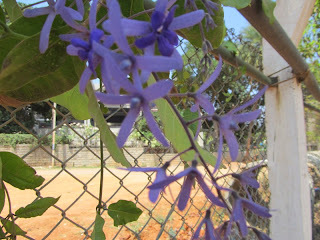 A few months ago we bought two saplings of Petrea Volubilis from Lal Bagh also called Queen's Wreath or Blue Bird Vine. What prompted us to buy was its profusion of flowers - delicate purple blue flowers in clusters covering the entire vine like a cloak. We planted the two saplings behind the security cabin and waited for it to flower, training the lengthening tendrils carefully on the chain link fence. It is a quick growing plant so the wait was not very long and recently we saw that one of the two vines had begun to flower but where? Outside the fence! Not again! Why do these plants nurtured so carefully flower on the other side of the fence? No wonder they say that the grass is greener on the other side! We can't fight the ways of nature but that didn't stop us from bringing the flowers to the lake side. Let us at least get to see the exquisite bloom till such time the vine grows profusely and presents its flowers not to the lake visitors but to passers-by! 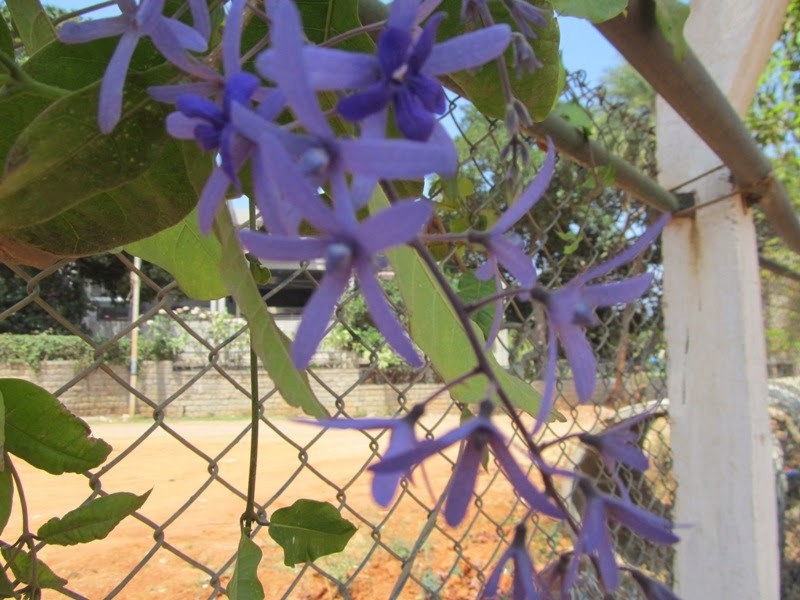 For info on Petrea Volubilis, read here. By getting the Puttenahalli Lake rejuvenated, we have shown that it is indeed possible for ordinary citizens like us to effect a positive change to the community. 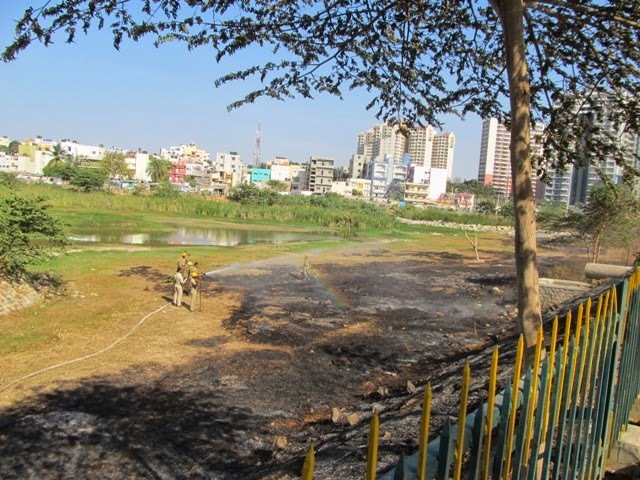 However, our work has just begun and in order to execute our very many plans that will complete the transformation of the lake, we need your help. Please do not dismiss this mail as a "What do I know about all this?" or "I don't have the time..." etc. We did not get into lake conservation because we knew what to do but because we wanted to restore the lake come what may. We were aware that in the process we'd make mistakes in plenty but we were, and are, prepared to learn from them. 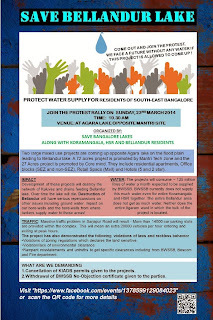 We readily share our experience with anyone interested in reviving a lake anywhere in the city or elsewhere. It is only by all of us working together that we can hope to avert the water crisis looming over a city once called "The City of Lakes!" On the occasion of International Women's Day, we appeal to all women to join us. 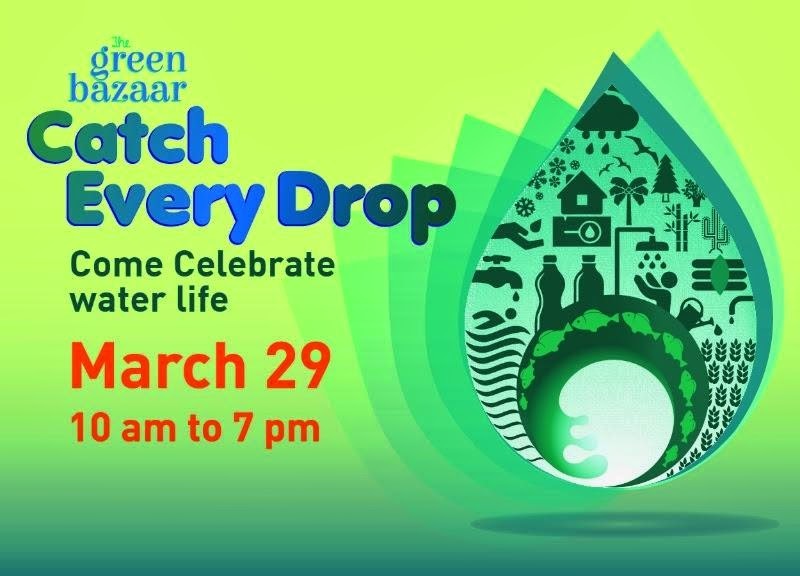 Discover the hidden potential in you by being a part of this community initiative to nurture our immediate environment. You will make a difference not just to and for yourself but also for your family and society. Needless to say, this invitation is open all men and children too! Together let's celebrate "People's Day!!"